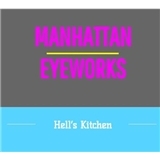 Manhattan Eyeworks has been a neighborhood optical facility for 7 years. We offer the latest in fashionable designer eyewear, lenses, and contact lenses while preserving exclusivity and originality with our selected brands. Our frame stylists are not only professional, we pride ourselves on our one-on-one personalized customer service and our ability to assess all of your professional and practical optical needs. Only our optical in the heart of Hell‘s Kitchen can offer such honest quality. Our optometrists, who have more than 30 years experience, are all knowledgeable and caring. They will answer all questions about your vision . Our optometrists offer wide range of services that include comprehensive eye examinations, glaucoma screenings, contact lens fittings, consulting on Lasik surgery and lens options for your eyeglasses. I did not get to meet dr. Salzan, but the staff was very friendly and helpful!